Young Justice Season 2 Episode 14 - The Ethnic Super Friends Are Back! 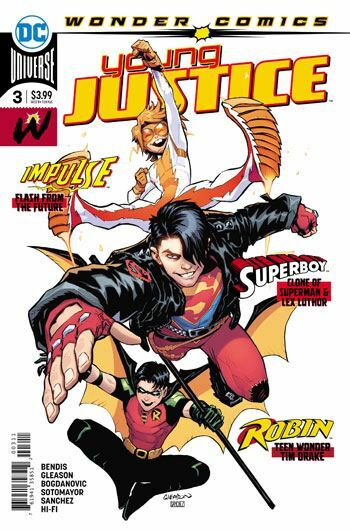 Young Justice 3 is largely devoted to Superboy, who explains to Impulse where he has been all this time. The other members of the team are only seen briefly, faring poorly against Dark Opal and winding up imprisoned on Gemworld. Superboy’s backstory does a good job of re-introducing us to the Conner Kent we were familiar with, before detailing a terrible decision that he makes, one that winds up transporting him to Gemworld, where he has been ever since. Not too much more can be said about this issue, as there are a couple very big spoilers involved. So instead I will mention how much I am enjoying the art. A number of illustrators contribute to this book, and the different inkers are employed well, providing a distinctly different feel to the scenes taking place on Earth, and those taking place on Gemworld. I wonder which Superboy will get to keep the name. Jonathan Kent has been relating his own adventures in the pages of Superman, as well as appearing with Damien Wayne in Adventures of the Super Sons. There really can only be one Superboy, but both Conner and Jonathan have strong rights to the name. I admit, I would be hard pressed to pick one, but I suspect it might be Conner who takes on a new identity before long. Partly that’s because of the spoilers I am not going to discuss. So what else can I talk about? Teen Lantern still hasn’t won me over, although the character did provide a good laugh this time around. The story is unfolding well, and I am eager to see how it all plays out.